That phrase from her scrapbook describes Sister Grace Dahmus’ 50 years as a Benedictine sister of Annunciation Monastery. Raised on a farm near Regent, ND, Sister Grace (birth name, Mary), was the fourth of eight children born to Rudolph and Catherine Dahmus. In September 1957, after graduating from high school, Mary entered Annunciation Monastery. She began nursing courses at the University of Mary and started as a nurse’s aide at St. Alexius Medical Center where she remained until she became a novice in June 1958. Sister Grace made her first monastic profession in 1959. There was a great need for teachers at that time, so Sister Grace was asked to become a teacher. She says, “It felt natural to teach because I love children and learning.” She graduated from the University of Mary in 1969, and taught in diocesan and parochial schools at St. Mary’s, Bismarck; St. Joseph’s and Trinity Grade School in Dickinson, and St. Joseph’s in Mandan. She attended Mundelein College in Chicago, IL, for religious education training. For teaching sisters, there was no such thing as summer vacation. Sister Grace counts 50 parishes where she taught vacation Bible school in rural towns where she offered CCD classes, first communion and confirmation classes. She also taught summer school on the reservations of Fort Totten, Standing Rock and Fort Berthold. She has a great respect for the culture and people of the reservations. Sister Grace always kept up her nursing certificate as a certified nurse’s aide (CNA) so she could serve as teacher and nurse. 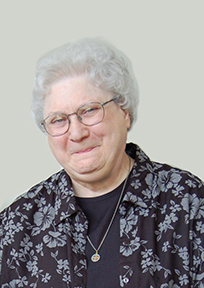 After retiring from teaching, Sister Grace received training in Clinical Pastoral Education (CPE) and served as hospital chaplain at St. Joseph’s Hospital in Minot and St. Alexius Medical Center. She also worked in hospice and home health care in Minot. Volunteerism has always been important to Sister Grace. She donated time and energy to the University of Mary library, Retired Seniors Volunteer Program (RSVP), in laundry services at St. Vincent’s Care Center, and as a CNA at Annunciation Monastery. A farm girl at heart, Sister Grace enjoys the outdoors. She had been an avid reader all her life until macular degeneration made it too difficult to read. The gift of “Talking Books” allows her to continue her love of reading and keep connected to the world.